Improved bathroom and kitchen cleanliness can be achieved with Evo-Stik anti-germ, the first antibacterial sealant, wall tile adhesive and grout range that offers extra protection against infection. No matter how rigorously you clean kitchen and bathroom surfaces, it's impossible to get rid of all the grime that lurks in the gaps and cracks between your tiles. Even worse, that pure white surface sealant you used to finish the job becomes a breeding ground for ugly black mould - and home to millions of bacteria. Evo-Stik's new anti-germ range of white and translucent sealants for kitchen and bathrooms, and all-purpose wall tile adhesive and grout, at last offers a solution: the first products of their kind that kill germs - and go on killing them! Anti-germ destroys MRSA, E-coli, Salmonella and other bacteria that can cause serious diseases, especially in the young and the elderly. 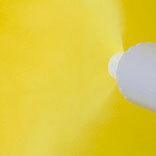 It also stops mould and fungi growth, meaning your kitchen and bathroom will stay whiter for longer. Evo-Stik's Joanne Davies said: "Anti-germ makes sure that the antibacterial properties are carried deep into the gaps and cracks between tiles - properties that last a very long time and keep white sealant whiter longer." 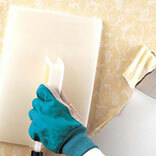 The anti-germ range features white and translucent versions of both kitchen and bathroom sealants, and an all-purpose wall tile adhesive and grout. 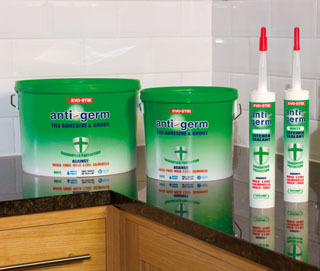 For more information about the anti-germ range and to find your nearest stockist, contact Evo-Stik on 01785 272 727. 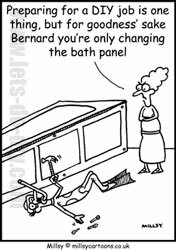 Alternatively, log on to www.antigerm.co.uk.